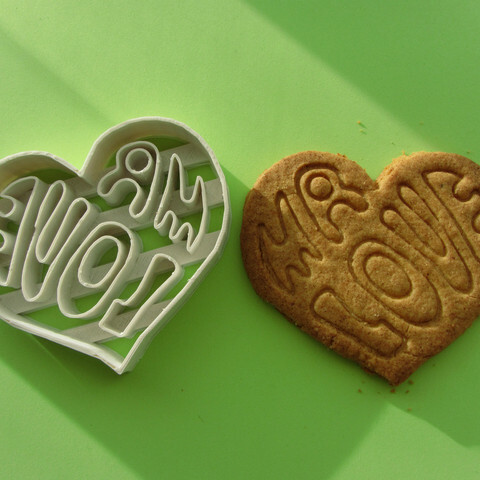 This is a heart shaped cookie cutter (or biscuit in the UK) with 1970s style lettering writing as 'MR LOVE'. It will cut out heart shaped cookies with the lettering incised in the dough. The cookie dough should be fairly stiff and I recommend dipping the cutter in flour before pressing out the cookies. Generally the uncooked dough comes away easily from the cutter, but you have to be careful. The envelope size of the cutter is 100mm x 87mm x 10mm. The gap between the heart outline and the lettering is 3mm, so any dough needs to be thicker than this. The wall thickness of the letters and the outline is 1mm. The printing time is dependent upon the quality setting of the printer - I suggest 'best' - and is approx. 90 mins.